On Thursday 26th November, Beaufort House Chelsea celebrates its Fifth Anniversary and in the process will be raising funds for our preferred charity, Scope. people and their families every year. Simon Oldham, co-director of Beaufort House, recently completed the Ironman World Championships in Hawaii in aid of this amazing charity. 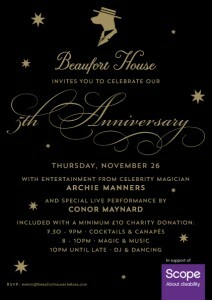 Our Fitfh Anniversary Party will include a complimentary cocktail reception with Beaufort’ House’s signature canapés and cocktails until 9pm, live entertainment by celebrity magician, Archie Manners, and a very special music performance by Conor Maynard. To purchase your tickets click HERE. Remember every penny of ticket sales is in aid of SCOPE.